Stopping a tyre from slipping on a wheel, when it is at low pressure or flat, is critical if the vehicle is to remain mobile. 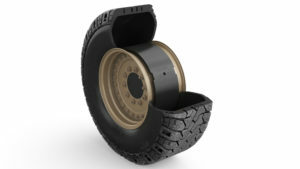 Tyron, world leaders in multi part all terrain rubber runflats, has increased its range to include a rubber system to lock the tyre to the wheel which will be on display on stand N9-300 at DSEI being held in London from 12 to 15 September 2017. The Tyron Rubber Beadlock System, or Tyron RBS, is designed to firmly push the bead of the tyre against the wheel flanges so that the tyre does not slip and the vehicle lose traction. Using rubber, which is inherently malleable, Tyron is able to over manufacture the RBS to overcome the tyre and wheel manufacturing tolerances and also allow for different makes of tyres which can be over 20mm. During installation, the rubber of the RBS will guarantee that the tyre beads are firmly secured against the flanges of the wheel to ensure beadlock. “The Tyron Rubber Beadlock System we are introducing has been designed following customer requests for a solution to keep tyres in place. Using rubber, which is of course compressible, means that we can make it slightly larger to ensure a tight fit which is not possible with solid materials,” said Richard Glazebrook, Chief Executive of Tyron Runflat. “As rubber is a pliable material, fitting the Tyron RBS can be done easily by a fitter with only the tools needed to fit a tyre,” added Mr Glazebrook. Another necessity for a secure beadlock is to prevent foreign objects such as sand, water, stones and dirt getting inside the tyre and compromising the Central Tyre Inflation (CTI) System, fitted to many military and security force vehicles. The Tyron RBS has been designed to fit with a CTI.